In what I predict will become one of the biggest hits of the 2007 Scottsdale International Film Festival, Korean director Sang-il Lee returns to the country of his birth for this true story of the 1965 closure of a northeastern Japanese coal mine in Iwaki that put more than two thousand people out of work. Eager to reinvent itself as a city on the cusp of change not only in regards to coal verses oil but also in the roles of men and women, and much to the chagrin of boycotting union families, the city planners decide to cash in on the tourist trade by erecting a state of the art Hawaiian Center and recruit local young women to become hula dancers. Two friends Sanae (Eri Tokunaga) and Kimiko (Yu Aoi) join the effort to train under the tutelage of the hot-tempered, seasoned and professional Tokyo dancer Madoka Hirayama (Yasuko Matsuyuki) who proceeds to whip the girls into shape despite being an unpopular outsider whose time in Iwaki is threatened after the family members and community objects. Despite her tough love tactics and hard persona, Hirayama quickly becomes the fiercest and most loyal protector of the young dance troupe in her willingness to go the distance and in her respect for the young women to let them take over as leaders once the teacher had paved the way. Much like the characters they play, the energetic young cast, led by Aoi, who earned numerous awards and nominations for her fine portrayal, had never danced prior to the shooting of the film and studied for three months in order to convincingly play the part, according to IMDB. While 1960’s women’s liberation is nothing new, seeing the transformative power of art and the way that self-confidence and teamwork help the young women mature in a Japanese setting is quite intriguing to behold and one not often depicted on film. Although boosted by the fact that the film is based on truth, some critics dismissed Lee’s work as a formulaic trifle in the tradition of The Full Monty, Dirty Dancing, Billy Elliott, Cool Runnings and A League Of Their Own as Hula Girls fits the mold of underdogs trying to carve out better lives and go against the grain but I found it to be an excellent companion piece to the socially-minded British film Brassed Off. However, what wasn’t being said in all of the dismissive reviews is that all of the previous films mentioned were wonderful in their own right and the formula works for a reason. Hula Girls is no exception—it’s an uplifting crowd-pleaser that, despite some anachronisms in the subtitle translation of dialogue that feels more modern than its 60’s setting, it’s a whole lot of fun. In addition, like Whale Rider and Bend it Like Beckham, the film is an ideal choice for parents of teen girls hoping to broaden their daughters’ horizons by introducing them to the world of foreign film. 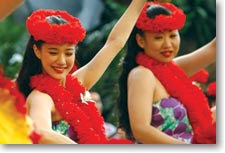 Hula Girls earned several Japanese Academy Awards including Most Popular Film and Best Picture, Director, Screenplay and others as well as being chosen by the country as the official selection for the Best Foreign Language Film submission to the 2007 Oscars.